These Thai pork in rice paper parcels are a delicious, gluten-free and low FODMAP (Fermentable Oligosaccharides, Disaccharides, Monosaccharides and Polyols) meal. This tasty, healthy meal is great for every season. Thai Pork in Rice Papers is not hard on the body or stomach with molecules that are hard to digest. Also, this recipe is gluten-free which is advantageous for those suffering from celiac disease or one with wheat intolerance. 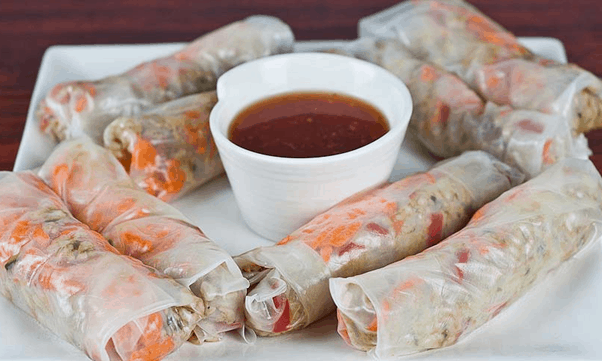 One thing to remember when making this recipe is to not let the paper rolls become too wet or they will turn to mush and therefore, become difficult to fold and roll. The rice paper rolls can be intimidating to some, however, they are actually fairly easy to work with and look impressive on the plate. Between the red pepper and the red chilli, this recipe is tremendously full of flavour and has a definite Thai taste. This is a great food choice for people with Irritable Bowel Syndrome (IBS) if you are ok with red chilli, if not they can be easily dropped. 1. Chop up the red chilli and red pepper finely. 5. Heat a little oil in a frying pan and add the red chilli and ginger. 7. Add the red pepper and cook for 1 minute. 8. Add the mince and cook until browned. 9. Add the soya sauce and fish sauces and season to taste. 10. Wet the rice papers as per the instructions on the packet. 11. Place a strip of the pork mixture and the grated carrot on each paper and roll up tightly. 12. Serve with the sauce. 13. Simply mix all of the ingredients to combine. If you think you may have a food intolerance or allergy be sure to check out YorkTest, food intolerance test experts. Previous Post: « Kellogg’s #GiveAChildABreakfast – Why is it important? These look great – thanks for sharing !! My daughter has IBS and we are currently negotiating the low fodmap diet. I think she will like these!